Karley Sullivan’s Satellite Hand is a hand-drawn catalog of the named moons of our Solar System. The drawings are made on scratchboard, lines cut and plains rise on the surface of the plates much like topographic features. 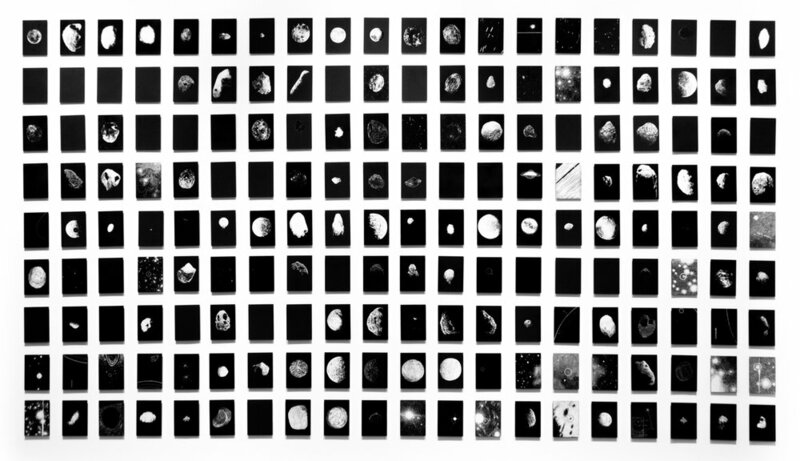 Sullivan sourced the images from the internet, carefully re-inscribing over 160 planetary satellites from the digital to the physical one by one. 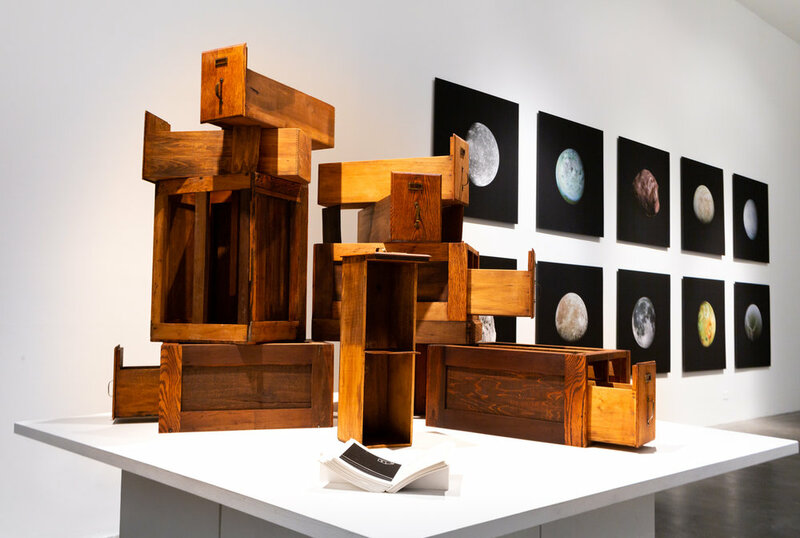 Installed at ArtCenter College of Design, Satellite Hand includes the completed catalog of drawings and The Order of Things, a sculptural piece commissioned for the Moons exhibition. Entering the space, I first encounter a deconstructed antique filing cabinet sprawled on a table like a child’s playset writ large. On the wall, within a tight grid of moons Sullivan includes numerous blank spaces. These are nods to the satellites not yet named, and their inclusion acknowledges the impossibility of complete comprehension. Standing in front of the grid, I also experience a gravitational pull. I’m drawn into the matrix, deeper into each individual piece, then deeper still into the luminescent detail of every captured satellite. The labor of the project is embedded in the weight of Sullivan’s touch. Her physical force is apparent in the scratchings that have lifted charcoal from the underlying white chalky surface. This practice is not dissimilar to the role of the archeologist - one who clears dust off an ancient relic, brushing away organic matter so that the object can be cataloged in the annals of human discovery. Delicate lines, frantic scratched gashes, calm swirls, delirious specks, and intersectional hatchings displace the charcoal and excavate the board’s surface. Pockets of erasure create a remarkable sense of contrast and meditational intent. This is no manifesto of celestial destiny. It is a collection of touches - some aggressive, others delicate or quirky, but all irrevocably human. And Sullivan serves, ecstatic yet dutiful, as the scientist and the scribe, the anthropologist and the oracle, and ultimately, as the mortal hand at the panel of mission control.